An arguable distinction of our societies rise to planetary control is the use of Tools. They are essentially what separate us from beasts, a sign of civilization and perfect demonstration of how far we've come with opposable thumbs and in gaining control of our environment. Tools forge this basis of Earth's hierarchy: A paramount aspect of our society that proved more than pivotal in getting us out of caves. Engines, computers, even as far as vessels to journey through and resist the vacuum of space, far & wide the implementation of ever developing tools have lead us. Evolution, progress: You'd think? Then why do we climbers strive to return to caves and all the while arguing the ethics of tool use? The questions of tool use now seem to have stepped into a whole new arena. Recent fracas over Cerro Torre’s Compressor route has divided Argentine Patagonia; good friends sit in both camps and offer strong cases toward completely removing the bolts and leaving them untouched. I feel the most important notion in the argument isn’t really the Torre or the route in question but the step toward validating history. Surely if we begin to back track through time and evaluate everything that has lead to current state of play won’t all development from fore runners be in question. Do we have the right to remove history? Should we eradicate all that does not fit into an idealistic mould or should we simply leave examples of poor style to punctuate a point? Cerro Torre is probably the best example, Maestri was proving the Compressor for a company that had paid his way down to Argentina, their hope was to win a contract on the proposed Alaska pipeline and Maestri had sold them on his plan. In my opinion the Compressor could have been done in finer style with very few anchors but then again I wasn’t climbing in Maestri era and can’t relate to a vertical world yet to be tamed by camming devices, sticky rubber and light weight gear. 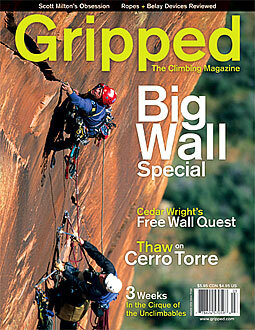 So what’s the deal with the Compressor route, not the controversy nor politics but the route, the climbing? I my humble opinion It’s an absolute classic, one of the best alpine routes around and what a peak! Undeniably one of our planet’s finer summits. El Chalten Argentine Patagonia offers a unique balance with town proximity, cragging and bouldering on the rain shadowed side of the cordillera. Don’t think external authorities understand what a bolt is (many of course do, I’m just posing an example) then how farcical must our community’s debates appear upon hitting the ears of those beyond our realm. Arguing claims toward legitimate land use won’t be treated seriously manor if we appear to segregated & split over issues that appear ridiculous externally? In North America authorities seem to view climbers as the lowest form of land users (strangely opposed the rest of the world’s opinion) and seem to have made up their mind without too much debate. We now hold the opportunity to prevent sentiment from rippling into fresh arenas where the land managers are a cleaner slate as per policies. If we indeed backtrack and eradicate history then should a first ascent permit scheme be introduced: Qualification before being allowed to establish a first ascent? Case in point, a tourist strolls through a picturesque gorge, perhaps returning to a favourite place to share with the next generation. While re-firing childhood memories and granting the same to offspring, they pass by proud climbers just after they step back to admire glinting steel freshly installed into the cliff. The tourist immediately becomes horrified and steps up asking “what have you done”. Confused the steep seeker responds, “What do you mean, this is my new route, those bolts went in from the ground up, no power drill”. Deeply offended that his sacred spot is now scared, the tourist marches toward the land’s authority intent on lodging his complaint. All the while the climbers stays on his heels explaining "Ground up" ethics, incessantly without taking a breath until a ranger is found. Authorities quickly process the situation, acknowledging that nobody has any understanding of this ‘ground up’ stuff. They simply see steel. Rangers deem it too late to shoot everyone and head for early lunch; they simply see a bolt as a strange fixture that the climber states as ‘ground up’. Their simple concern doesn’t stretch beyond metal sticking out of their precious gorge and temporarily ban climbing until a solution can be sought.